MasterShield and LeafFilter are both micro-mesh gutter guard systems, but not all products are created equal. There are a few areas where LeafFilter comes up short. Don't all gutter guard filters need to be cleaned? Most microfilters eventually suffer from "filter caking." Cake is a film that forms on the filter and can reduce or stop the flow of water through the gutter. We have found that many homeowners assume that all filters need to be cleaned. This is where MasterShield stands apart from the competition: MasterShield uses patented tangential flow cross-filtration to prevent filter cake. Other microfilter systems, like LeafFilter, are designed to force water and particles at holes. This results in some not making it through; similar to your car’s oil filter. With the MasterShield filter, the majority of the flow travels across the surface of the filter, rather than into the filter. This helps wash away the filter cake during filtration, so there's no worry of the filter clogging or needing to be cleaned. LeafFilter installs almost flat over the gutters. This creates a shelf for debris to sit on, which means you'll have to clean it off. 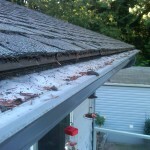 If it's not cleaned, the water will eventually rot the fascia or sub-roof or it will flow over the edge of the gutter, damaging your landscaping or even your foundation. 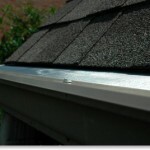 As rainwater flows down your roof, it comes in contact with debris. Some water might travel sideways or go over the top of a leaf, but most of the water stays in contact with the roof. Since the surface of the MasterShield gutter guard acts the same as a row of shingles, water comes in contact with the filter and is quickly and easily siphoned into the gutter. PVC expands at 2.3 times the rate of a surgical stainless steel filter. This means all it takes is one very hot day for the substrate to expand and stretch the filter. When it cools down again, the plastic filter will bubble. Since the filter is no longer in contact with the substrate underneath, the rainwater will overshoot the filter. If you are interested in installing microfilter gutter protecton on your home, install a system that's proven to work on homes in Greater Portland. Contact Leafless in Portland today for a free estimate on the installation of MasterShield gutter guards in Portland, Vancouver, Gresham or the surrounding area.